You have ventured into a land that you don't understand; where magic reigns supreme. Click here to play! How will you escape? Battle the evil Witch Doctor for your chance at massive cash jackpots. 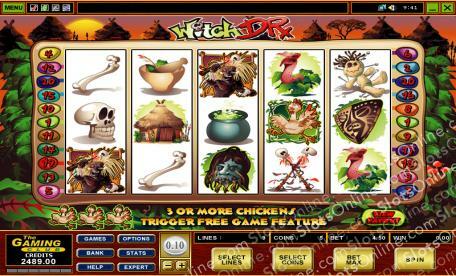 Witch Dr. is a riveting 5-reel slot played across forty pay lines of sheer excitement. Win yourself 15 Free Spins when you spin up three or more Scattered Chickens; the feathery fellow will also pay out when you get 2 or more of him in one spin. The Witch Doctor needs to be dealt with, so if you find him on any active pay line you will receive a payout. And if you manage to spin five of him in one go you will be receiving 5000 times your initial wager. The Witch Dr. won't stop until he finds you, so get to the reels and start spinning up some huge cash-winning combinations today! The Chicken is Scattered and will pay out whenever two or more of him appears on the reels. Also, if you manage to spin up three or more of him at once you will find your self with 15 Free Spins. The Witch Doctor is Wild and can be substituted for any other symbol except Scatters, as well as paying out up to 5000 times your bet.